Ever since the world of cosmetics and the world of tattooing combined, that industry has been steadily growing, drawing in more and more demand. The art of permanent makeup can be traced back centuries, from ancient Egypt to regions of Africa, Asia, and Europe. We tend to take a lot of trends from ancient Egyptians, as they were very focused on beautification and cosmetics. They would tattoo their eyes, mimicking eyeliner, along with geometric patterns on the face and body. However, the permanent makeup service only burst in popularity in the 1970’s. The trend really started with tattoo artists, but as people began noticing the great demand for this service, medical professionals and estheticians started studying the procedure. Things like microblading, lip tinting, and artificial freckles have recently burst into trends. Cosmetic tattooing can even be responsible for repairing the look of one’s areola after a breast surgery. However, while the process of permanent makeup is done in an attempt to beautify, there can be adverse effects. As in traditional tattooing, you risk fading, scarring, allergic reactions, peeling, cracking, blistering, local infections, and even keloids. If this is really a service that you desire though, it can greatly enhance your personal confidence. For example, if you suffer from alopecia universalis or alopecia totalis, you may have little to no eyebrows. With the help of microblading, the hairlike strokes replicate real hair and can eliminate the maintenance of applying and reapplying makeup to your face every day just to have the confidence to go out. Today, tattoos are symbols. Whether they represent your culture, your interests, your race, your social status, or just your creative expression, they symbolize something. The history of tattoo artistry itself is very vast. This method of body modification has been around for centuries, as proved by preserved skins dating as far back as Neotholic times. The oldest evidence can be dated back to somewhere between 3370 and 3100 B.C. on the mummified skin of “Otzi the Iceman”, Europe’s oldest human mummy known to this day. 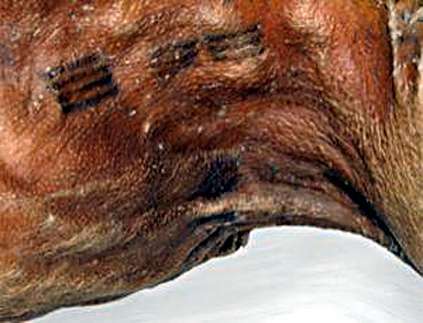 His body was found adorned in small black etching, later discovered to be tattoos. It is thought that tattoos were once used as an acupuncture-esque form of therapy, not to symbolize or represent anything about you or who you are. The parts on Otzi’s body adorned in tattoos were parts that endured more stress and wear and tear, like his lower back, wrists, knees, shoulders, elbows, and ankles. 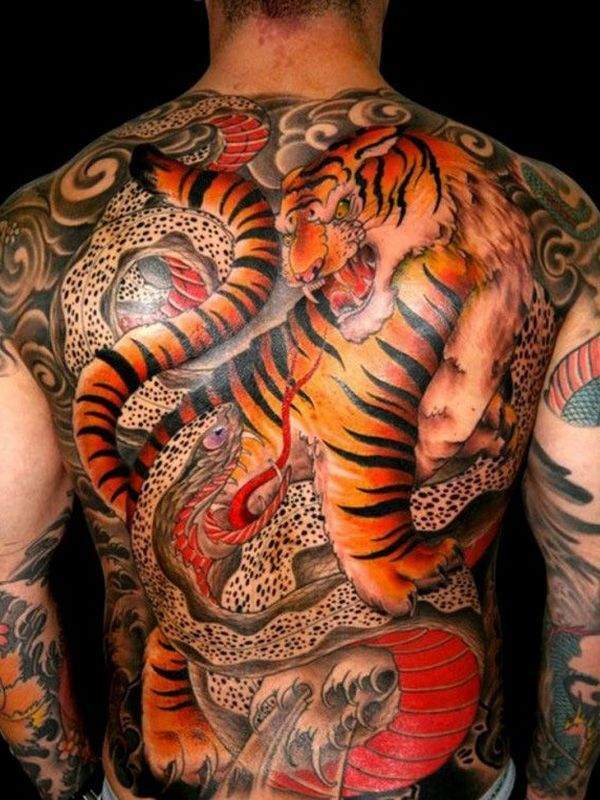 Many of his tattoos were placed on major joints of his body, which are also present-day acupuncture medians. Small incisions were made, and charcoal was then rubbed over his skin. Throughout the years, the meaning of tattoos has evolved greatly to say the least. What were once only a remedy to physical ailments are now a creative outlet to many, and will always have a place in society. The demand for tattoos is only increasing as time goes on and people are becoming more and more accepting, as well as with the need to stand out and set yourself apart from others. For a bit of background, Yazuka is a Japanese gang who’s origins date back to as early as the 16th century. You may remember the name of this group from a spectacular film titled “Kill Bill Volume 1,” however, this group itself is not fictional. More than 100,000 Yazuka members walk the earth today. 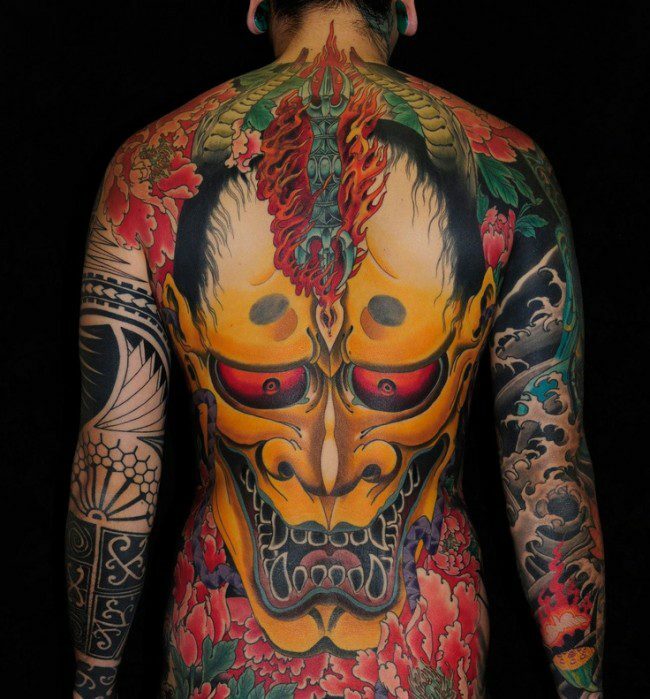 Since the beginning of this group, irezumi or Japanese-style tattooing has played a role with it’s members. It is somewhat a form of initiation, to be tattooed. There are pieces or symbols that happen to be common among the group, all baring different meanings and backgrounds. For example, the koi fish. This is a very common tattoo in Yazuka and it symbolizes good luck, or good fortune to the wearer. 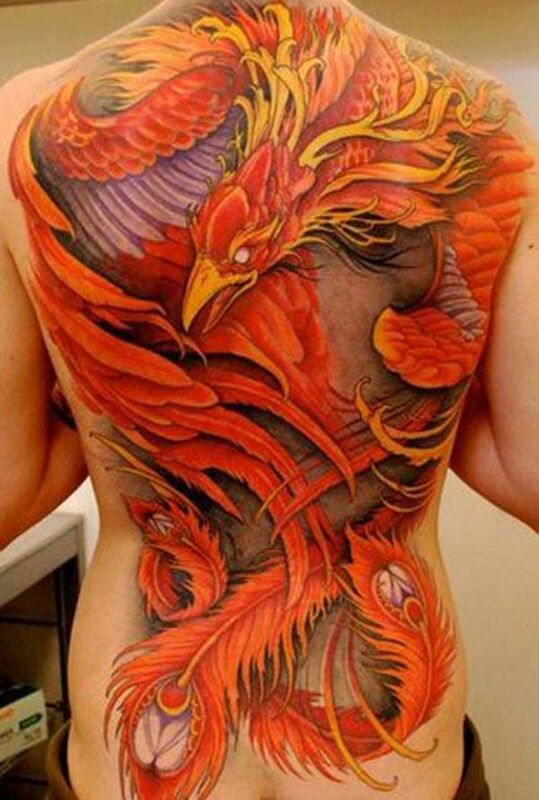 Another example is the Phoenix reborn from its own ashes, symbolizing triumph and rebirth. Tigers are meant to protect against disease, bad luck, and even demons. Speaking of demons, oni masks are also a common Yazuka tattoo. An oni is a gruesome ogre or demon that reeks havoc onto the wicked through cruel punishment. They can do horrible things like inflict sickness, insanity, or even death at will, as well as alter their form. This tattoo of course represents the distribution of punishment. Finally, the Foo Dog, or, “Lions Of the Buddha.” Foo Dogs are meant to be the protectors of Japanese Buddhist temples, and they come in pairs. Though they are called “dogs,” this creature is a lion. 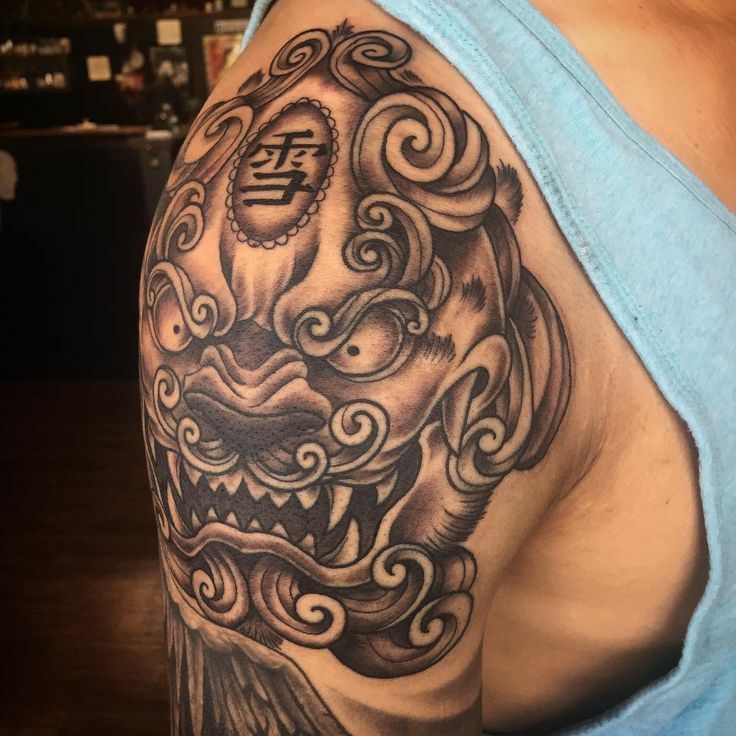 As a tattoo as well as in their statues around the sacred temples, Foo Dogs are meant to protect against both evil and danger. You may have seen a tribal tattoo in your life, or a few. They look kind of generic, known for being one of the most common styles of tattoo, however, tribal tattoos today are purely aesthetic. Tribal tattoos can be dated back centuries, making it difficult to know where exactly they first came to be. Known most for coining the style are islander locations like Pacific, Samoan, Polynesian, and Melanesian. The tattoos that are now kind of a generic, sometimes ironic-looking piece of work, used to have a far deeper meaning. These tribal tattoos were meant to represent something about you. Whether it be your social status, tribe that you are a part of, battle you have taken part in, or symbolism of nature that means something to you, they were meant to individualize your body and tell your story. Back then, there was also far more risk involved in receiving one of these tattoos due to the fact that the implements used were often porous. The risk of death from possible infection was extremely high, but to refuse would be to be known as a coward. To create these pieces, hollow needles used to hold the ink were crafted from anything the people could use, like bamboo, porcupine quills, or even bone. At times, these tattoos were even put to use for medicinal or ritualistic purposes. At one point in the 18th century, this style of tattoo was banned by the old testament. It wasn’t until the 1980’s that this style was brought back into the forefront of popularity. Due to the pain involved along with the idea of permanently marking your body, the tattoo world is seen as taboo to some. However, the removal of such markings can be even more painful, and in some cases can take even longer than it did to acquire the original tattoo. There are many methods that people have come up with over the years to reverse the work of their artists. For example, laser removal. This process requires selective amounts of laser penetration into the skin past the epidermis, into the dermis where the tattoo ink lies. While the ink in the dermis will slowly disperse naturally with time as white blood cells break down small bits of ink, the laser forces the larger pieces to separate using heat to force them to expand and break, allowing the white blood cells to remove as much as possible. The process of laser removal is the most popular and can be extremely painful and far more expensive than the tattoo you had in the first place. In college, sophomore Carly Cardellino got a matching tattoo with her friends. Just a simple fifty dollar star with a heart. Of course with age, she wasn’t so fond of this piece anymore. Her removal cost her a total of 4,000, and according to Ms. Cardellino (2016), “It looked worse than it did as a tattoo” (para. 2). Another less professional method is called “salabrasion” or salt abrasion. This method is done at home, and requires only salt, abrasive gauze, and water. In a nutshell, you are slowly scraping your tattoo off. You dampen your gauze, dip it into salt, and scrub away at your unwanted ink. After a few treatments of about thirty minutes each or until the dermis is reached, your tattoo can fade and potentially disappear. However, you are putting yourself at huge risk for infection and/ or severe scarring. If you are not a medical professional, you should not purposely be breaking anyone’s skin, especially your own. Just think for a long time before you permanently mark your body, because odds are that your idea of what looks good will change as you age. Throughout African history, the techniques and meanings within the tattoo culture have changed. For many years in the past and to come, the tattoos can be a symbol of things like social status, tribe affiliation, and bravery or courage. The scarification method is also very prevalent in Africa. Scarification is the cutting of one’s skin deeply enough to leave a scar in the form of a pattern or symbol onto the body. In Africa, the methods of scarification and tattooing go hand in hand. This method is known as “cicatrization”. This method is performed through first cutting into the skin. You have to cut deeply enough for it to leave a textured scar, usually done with razors or thorns. Then, in the open wound, charcoal is rubbed. This will leave you with a textured and colored design or pattern. These scars were often re-opened at a later time to be made more prominent by adding pebbles or pearl-like things underneath the skin. For women, often these markings correlate with fertility. These markings are made on girls traditionally at puberty. Then, again they are marked after the birth of their first child. The markings are meant to commemorate these women for going through the painful process of childbirth. For men, the markings are indicative of manhood. At puberty they are first cicatrized. Then, as they approach manhood, they undergo the re-opening of their scars so that they can be made more prominent with the additions or pebbles or pearls. In modern-day Africa, however, regular tattooing is more dominantly found. The American traditional style of tattooing has been around for years. It originated around the time of World War II, as many soldiers from the Navy were sent to Honolulu, Hawaii. A man by the name of Norman Keith Collins or, “Sailor Jerry,” decided to open and run his tattoo shop there. As a symbol of patriotism for many, the other men wanted work done by Jerry, as his style was inspired by patriotism along with new techniques. The images tattooed at the time were kept fairly simple with the use of bold black linework, and the color range mostly dominated by primary colors. The main colors used were red, blue, yellow, white and green. Many of the images requested and available were things like beautiful women with American flags incorporated, swallows, hearts, and roses. As tattoos usually do, this imagery meant certain things. For instance, roses are a symbol of love. In these difficult times, it was very possible that your husband or anyone that you loved could be sent off to battle. When someone got a rose back then, it symbolized their desire to someday see their loved one again, as every goodbye could have easily been their last. Another example would be the swallows. The swallows, to the sailors, represented a certain freedom. As the soldiers were always under the command of someone else, the swallows that would often stow away on their ships would remind them of home as well as inspire them to keep on going and to not fear what lies ahead.